The bull tamers were strictly advised to apply for insurance under the Prime Minister Suraksha Bima Yojana (PMSBY) by the district administration against any sort of injuries (both fatal and non-fatal) during the event. Madurai: A total of 596 tamers and 691 bulls had registered for the Avaniapuram Jallikattu that is scheduled to be held on Tuesday, stated a report. Bull-tamers completed their registration ahead of the year’s major Jallikattu in Avaniapuram located in Madurai district of Tamil Nadu. The bull tamers were advised to apply for insurance under the Prime Minister Suraksha Bima Yojana (PMSBY) by the district administration against any sort of injuries (both fatal and non-fatal) during the event. Despite facing conflicts from the local organising committee, arrangements for the bull-taming event scheduled for January 15 were on in full swing. The event is organised by local people. However, due to issues within the committee, various groups filed writ petitions to the high court bench chaired by the retired Principal District Judge C. Raghavan. The new organising committee appointed by the Madurai Bench of the Madras High Court reviewed the Jallikattu arrangements on Sunday. Precautionary measures have been taken to ensure smooth conduct of the event. Barricades have been put up by the Madurai corporation. A report stated that four fire tenders, 11 ambulances and medical teams from Health and Animal Husbandry departments would be available during the event on Tuesday in Madurai. The meeting was attended by representatives from various departments like Fire and Rescue Services and Health and Family Welfare (HFW). Meanwhile, the arrangements for the Jallikattu events at Palamedu and Alanganallur are in full swing. While the event in Palamedu will be held on Wednesday, the Alanganallur Jallikattu will be held on Thursday. 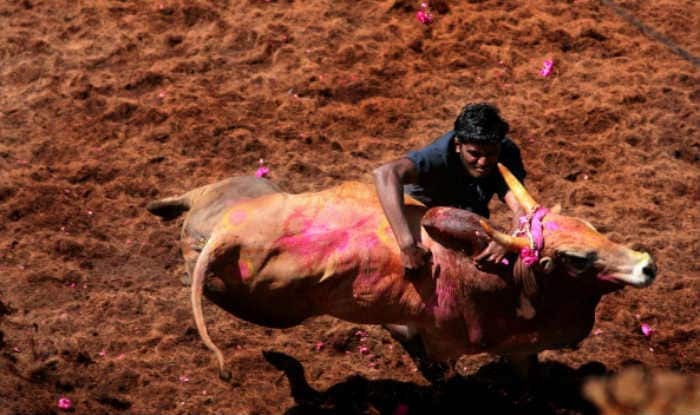 The Tamil sport ‘Jallikattu’, which is held during the harvest festival ‘Pongal’, was banned by the Supreme Court order in May 2014. However, an ordinance was brought in by the state government last year to lift the ban.